"Ryde is the largest and in many respects the most important town in the Isle of Wight. It is the principal thorough fare between the mainland and the rest of the Island, but it is only fair to Ryde and its inhabitants that it should be here stated that the visitor who only passes through to Ventnor or Newport sees Ryde at its worst, with the exception of the unparalleled picture the little lofty wooded town presents to the passenger on board the steamer if that steamer should happen to make a slight detour at the western angle of the pier head, as is sometimes the case. From this point Ryde looks glorious in a summer’s sun. We know of nothing in the Isle of Wight so charming in its way, and every visitor should get his first impressions, if possible from this point. If, however, the visitor is taken through by rail he sees Ryde from the worst possible aspect. This fact should never be overlooked, and we are sorry to say it applies to several of the other towns, notably Shanklin. Ryde must be explored to be appreciated. It is loftily situated, some of its streets are well laid out and all cleanly kept, the buildings are substantial and of creditable architecture, there is a luxuriance of foliage, and altogether it is a beautiful town, where the visitor may find plenty to please and to occupy his mind. In 1793 Ryde was a village comprising two, parts - upper and lower - and formed a portion of the far-reaching parish of Newchurch, which also embraced Ventnor and the intermediate towns and villages. Ryde and Ventnor became separate parishes by Act of Parliament in 1866. Ryde was known by the name of La Riche, or La Rye, in the time of the Normans. During the reign of Richard II, the French took the place and burned it to the ground. Ryde has often been noticed in the writings of men of mark, among them being Fielding, the great novelist, who visited the town in 1753. According to his account of his visit, the landing of passengers from the sailing ships was an extremely difficult matter, owing to the abundance of mud on the banks. The visitor had to get out of the larger vessel into a small boat, and be rowed shoreward as far as the shallow water would permit; then be mounted on the back of a boatman and thus carried ashore, these boatmen being familiar with the only safe ford through the mud. In the days of Marryatt (“Poor Jack”) a slight improvement was reported. He wrote of ”the wherries that came in as far as they could, and were met by a horse and cart, which took out the passengers and carried them through the mud and water to the hard ground.” The Ryde mud bank appears to have been gradually vanishing since those clays, probably owing to the encroachments on the sea board in front of the town for the construction of the grand Esplanade, the railway track, and the goods wharves. On both sides of the pier there is now a broad expanse of fine sand, but the visitors cannot enter into the full enjoyment of this change, owing to the difficulties of approach. The old notion of mud banks at Ryde, however, should be relegated to the things that are obsolete. Ryde overlooks the Solent at a point known as Spithead, the most famous naval rendezvous in the world. There in 1782 “Brave Kemperfelt,” with six hundred souls, went down with the Royal George, and perished. This sad event occurred on the 29th of August, and was witnessed by the people promenading the streets and lanes overlooking the sea. The ship was lying at anchor, and she was heeled over on to her Port side for cleaning and repairs; the admiral was in his cabin at the time, writing. In weighting the port hand of the huge vessel the officers directing the operation over-calculated her capacity for such a strain; she was brought over too far, and down she went. “The ship, when first she filled,” says a writer, “fell over so as to dip the flag at her masthead in the sea. Then, rolling back, she fell over to the other side, till her yardarms touched the water. She then righted and sunk nearly upright. While she was sinking nearly every soul on board came on deck, above 1,000 persons - not 400 were saved. The eddy made by the sinking ship was so great that a large victualling barge which lay alongside was drawn in and lost with her.” Many of the bodies of the drowned were washed ashore along the coast, and were buried in a field known as the Duver, lying in the valley between the town and St. John’s on the east side. The population of Ryde in 1811 was 1,601, when the 1891 census was taken it was 12,249. In 1813 a local Act was obtained, and, as Ryde was beginning to attract visitors in search of health and recreation, attention was turned to the erection of a pier. The first stone of this structure was laid on the 29th June, 1813, and the pier was opened in 1813, its length then being 1,740 feet. In 1824 its length was increased by 300 feet, and a further extension was made nine years later. In 1842 the head of the pier was widened for promenading purposes, and the pavilion was constructed, and the pier head was further enlarged in 1856 and 1860. Its total length now is 2,250 feet. About twenty years ago a twin pier was constructed alongside the promenade pier, for the purpose of a tramway track, the tram cars, until recently, being drawn by horses in pairs. Another pair of tram rails have recently been added, and both sets are now worked by electricity, an exceptionally pleasant and popular mode of transit from one end of the pier to the other. The pier toll is 2d. per passenger each way, and the tram fare 1d. second class, and 2d. first. The pier and train belong to a limited liability company. The Railway Pier, which runs parallel with the double breasted old pier and a few yards distant on the east side, is built of iron, and is used only for railway purposes, enabling passengers to be taken to within half a minute’s walk of the boats. It was built about the year 1878 by the joint railway companies (the South Coast and South Western), and is under the management of their representative, Mr Fisher. There is another pier eastward of this one, the Victoria Pier. It was built by a rival company, but the concern came to grief, and the structure subsequently became the property of the owners of the old Ryde Pier, and is now used as a bathing stage. The town became an incorporated borough in the year 1868, with a mayor, six aldermen, and 18 councillors, the first mayor being Mr Thomas Dashwood. The town is well paved and is lighted with gas, the gas works belonging to a company. The private borough provides its own water supply, the water works being at Knighton, about three miles from the town. The police are under the control of the Corporation, and local cases of magisterial administration are adjudicated by borough justices of the peace. It is built of stone, on the north side of Lind street, in the heart of the town. The foundation stone was laid by Mr John Lind in 1830, then intended as the Market Hall, for which purpose the lower part of the building is still used. The upper part was more recently constructed, and the handsome clock, which is illuminated at night, was the gift of Miss Player. The large hall upstairs is capable of seating 1,000 people; there is a small hall on the same floor, the Council Chamber, and other offices. The great hall is adorned with a number of large marine paintings, executed by the late Mr A. W. Fowles, a self-taught Ryde man, and presented to the town by the late Mr Vivian A. Webber, K.L.H., also a resident of Ryde, who gave similar valuable paintings to the towns of Newport, Ventnor, and Shanklin, from the easel of the same artist. On the wall of the Town Flail is also “an old master,” presented by Mr Adye. The “old master” shocked the modesty of some of the prude inhabitants when hung, and a gentleman at that time “dressed in brief authority,” had the picture so altered as to give it a colouring of less immodesty. This evoked much ridicule from the press and the public on one hand, and on the other a torrent of severe expressions of indignation from cultured artists, who denounced the Ryde authorities as Vandals of the deepest guilt. Both classes of critics, however, have by this time recovered the shock, and things are going on much as usual. Of churches and chapels there are a goodly number. The Parish Church (All Saints’) is situated in the Queen’s Road. It was designed by the late Sir G. G. Scott, R.A., and erected in 1870, the Princess Christian laying the foundation stone on the 4th August, 1869, and Bishop Wilbetforce consecrating it in 1872. It is a splendid structure in the Gothic style, and pronounced by many to be the finest parish church in the south of England. It cost £16,000. A grand spire has recently been erected and peal of bells added, and yet more recently at the side of the church has been built a parish room for educational and parochial purposes. Holy Trinity Church is situated in Dover street. It cost £7,200, and was built in 1842. It provides accommodation for 1,050 worshippers. The structure is of the Early English style. It is surmounted by a magnificent steeple. St. Thomas’s Church, near the Town Hall, was erected in 1827 on the site of a former church. It belongs to the Player family. It is regarded as a chapel of ease to the Parish Church. St. James’s Church, almost adjoining the Town Hall, was built in 1829, at a cost of £6,000. It is a plain structure of the Tudor style of architecture, and is a proprietary chapel. St. Michael’s, Swanmore, is conducted as a “high church.” It was opened in 1862, and completed in 1864, at a cost of £5,000. There are 500 sittings, all of them being free. St. John’s, St. John’s Park, was built in 1843, in the Early English style. It contains nave of four bays, south porch and aisles, and a western turret with two bells. The church can accommodate 600 worshippers. St. Mary’s Roman Catholic Church, in the High street, was erected in 1846 by the Comtesse Clare. The style of architecture is Early English, Mr Hansom being the architect. It contains fine pictures of the Crucifixion and the Annunciation. 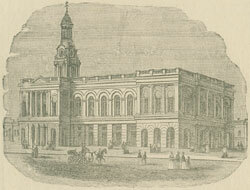 The Congregational Church, at the corner or George and Melville streets, was erected in 1871. Its architecture is peculiar; the building is one of the funniest landmarks to be met with in a day’s journey by rail, road, or sea. The Wesleyans have a new Chapel in Garfield road. Its architecture is described as “a debased Italian style.’ It was erected in 1884-5. The old chapel in Nelson street - was erected in 1842, and was until recently used as a Sunday School. In 1892 commodious school and class rooms were erected by the side of the new chapel in Garfield road. The Baptist Chapel (Christ Church), in George street, was erected in 1862, in red and white bricks, with a turret and spire. A pretty building, capable of seating between 500 and 600 persons. The schoolroom is at the back. Park-road Baptist Chapel was erected in 1870 at a cost of about £1,200, and accommodates about 500. The schoolroom is beneath the chapel. The Primitive Methodists have a chapel in Star street, to seat 250. Erected in 1841 and enlarged in 1860. The Free Methodists meet in a small Chapel in William street, Swanmore, erected in 1836. In the same street is Zion Chapel, built in 1853. The Bible Christians have a Chapel in Newport street, erected in 1860. It is capable of seating about 400 persons. The Plymouth Brethren hold their meetings in one of the rooms of the Town Hall. The Salvation Army erected “barracks” in Green street in 1888, capable of accommodating about 450 worshippers. Every visitor to Ryde should take a walk through the Cemetery, which is located off West street, and within a few minutes’ walk of All Saints’ Church. The grounds comprise an area of about ten acres, and belong to the Corporation, the cost of acquiring and laying out being £8,000. Ryde once had a Philosopical and Scientific Society, with which was attached a museum, which has now passed to the School of Art. The Young Men’s Christian Association has a beautiful building near the Town Hall and Theatre Royal. It was erected at a cost of upwards of £2,000. The Royal Victoria Yacht Club’s headquarters are situated in St. Thomas’s street, not far from the pier. The stone building was erected in 1846, the memorial stone being laid by the late Prince Consort. The annual regatta of this club in August is one of the leading events of the season. Recreation Courts. - These were erected in Bennett street by Mr. B. Barrett, in the year 1889. The Freemasons have a hall in John street. The Temperance Hall, also in the High street, was erected in 1884 on the site of an old building used for temperance and educational purposes. The Theatre Royal, in the centre of the town, is a noble edifice, and is a great attraction to both residents and visitors. The Royal Isle of Wight infirmary is situated in the upper part of the town. It was erected in 1849, at a cost of about £2,000, and was enlarged in 1866, 1882, and 1888. It is supported by voluntary contributions from all parts of the Island, and patients are received from all parts of the same constituency. Ryde Dispensary, in Newport street, was established in 1842. In connection a Provident Dispensary was inaugurated in 1890. Convalescent Home. This was opened in West street in 1880, and has ten beds. Banks : The National Provincial and Capital and Counties both have branches in Union street. Local Newspapers: Isle of Wight Observer (belonging to Mr. J. C. Hartnall), the Isle of Wight Times (Mr. H. Waylane), and the Ryde News (Mr. W. Guilbert).